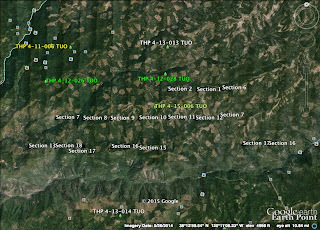 THPBlog: Sierra Pacific Industries planning a new clearcut THP east of Arnold, CA. 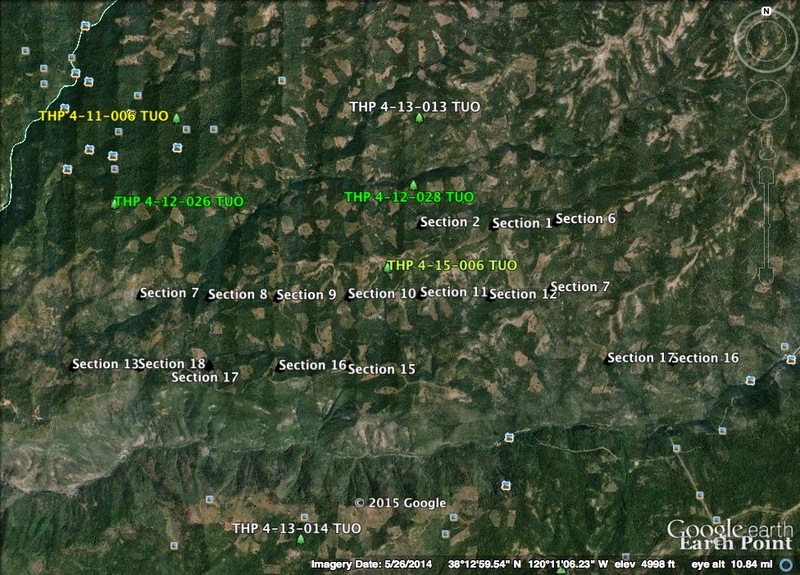 Sierra Pacific Industries planning a new clearcut THP east of Arnold, CA. This THP is about 9 miles SE of Arnold, CA and about 5 miles west of Beardsley Reservoir at an elevation of 3,500 to 5,500 feet. Sierra Pacific Industries is planning a mostly clearcut tractor based logging operation in ponderosa pine, sugar pine, incense cedar and white fir forests. The THP includes 6 acres of conifer removal around Grohl Meadow, and drains towards the Middle Fork of the Stanislaus River. There are 3 unstable areas including 2 concave areas formed from past skidding operations, and a cut bank slump off an existing road inside a class I watercourse. SPI wants to use 2 existing skid trails inside a class II watercourse, 2 existing seasonal roads inside a class I watercourse, and a landing inside a class III watercourse. They also want to be able to use ground based equipment across class III watercourse crossings during the winter period. 79 road drainage sites are planned for work including rocking, dip construction, ditch cleaning, culvert repair/replacement and restoration of washed out crossings. Goshawk nest sites are located in sections 4,11 and 13. More information is available on the THP Tracking Center website.